The Level 3 First Aid at Work (statutory) course complies with the current Health and Safety (First Aid) Regulations 1981. Successful students receive certificates to show that they are qualified to be First Aiders in the workplace for the next three years. This course includes Defibrillator (AED) training. A person who has been designated as a first aider at work. All employers in the UK have a legal obligation to make First Aid provision for their employees. burns and scalds, small splinters). recognise the presence of major illness and provide appropriate first aid (including heart attack, stroke,epilepsy, asthma, diabetes). A Level 3 award in First Aid at Work certificate valid for three years. Renewal is by attending a two day Re-qualification course before the expiry date of the original certificate. Please note certificates can no longer be post dated to the date of the initial certificate. All qualifications are validated through an awarding body approved by OfQal. 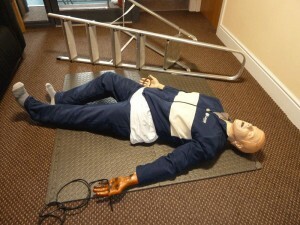 Attendance on a three day First Aid At Work course will be necessary if validity has lapsed. The HSE strongly recommend qualified FAW personnel attend annual half day refresher courses prior to them completing the required re-qualification course. Price – Please give us a call on 0151 207 0081 for our latest prices and for group discount information.